Work is nearing completion on Sheikh Jaber Al Ahmad Al Sabah Causeway (SJSC), a mega project spanning 37.5 km across Kuwait Bay from the capital Kuwait City to Subiyah area, reported Kuwait News Agency (Kuna), citing a senior official. Hyundai Engineering & Construction (Hyundai E&C) is building the landmark bridge. The Korean group had won the $2.62-billion project contract in November 2013 along with a local company (Combined Group). 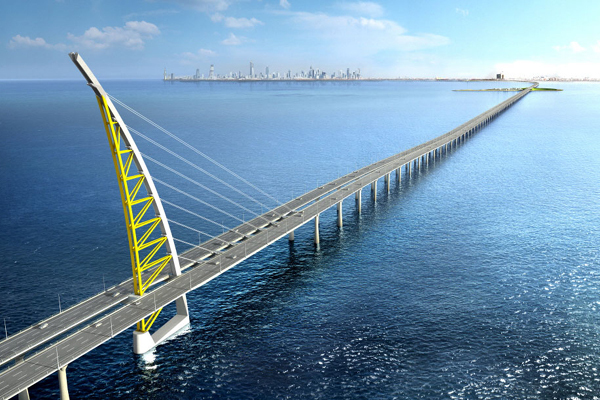 Sheikh Jaber Al Ahmad Al-Sabah Causeway Project (SJSC) is one of the world's longest and most gigantic high-speed bridges, said Osama Al Otaibi, the chairman of the Municipal Council. "It includes a 7-km-long bridge and the Doha Link, which spans across Sulaibikhat Bay from Shuwaikh Port in Kuwait City to Doha Peninsula, with a total length of 12.4 km," noted Al Otaibi while talking to the media during an inspection tour. "The mega transport project is one of the landmarks in His Highness the Amir's 2035 New Kuwait vision; It will cut short the distance between the Capital City and Subiyah area and remarkably ease traffic between the northern and southern parts of the country over the coming three decades," he added. The world's fourth longest bridge, Sheikh Jaber Al Ahmad Causeway follows the latest standards of construction," remarked Engineer Soha Ashkenani, the acting director-general of the Public Authority for Roads and Transportation. "The project envisages launching two industrial islands, one near Kuwait City and another near Subiyah with total area of 300,000 sq m each," she stated. Ashkenani said the project starts from the intersection of Jamal Abdul-Nasser St. and Al-Ghazali Highway to the New Subiyah area at the northern side of the Kuwait Bay with a view to easing the traffic jam in this vital part of the country. Once opened, the causeway will shorten the distance between the Capital City and Subiyah area from 104 km to 37.5 km. and cut short the average time spent by motorists from 90 to only 30 minutes," she added.